Enjoying all of the adorable Anita’s Playhouse animal designs? 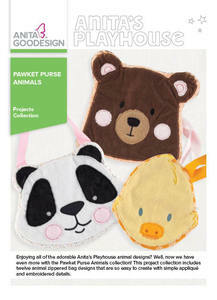 Well, now we have even more with the Pawket Purse Animals collection! This project collection includes twelve animal zippered bag designs that are so easy to create with simple appliqué and embroidered details. The best part of this project series is that we’ve added steps to show you how to create a fully lined bag, as well as how to add ribbon to create a wristlet or shoulder bag! Create these unique and fun animal bags by using a variety of felts, fleeces, and other textured fabrics. Individuals of all ages will love to carry around their Anita’s Playhouse Pawket Purses featuring Bo Bear, Klaus Mouse, Effie Giraffe, Linus Lion, Rocco Raccoon, Ollie Owl, and more! Create them all!